Ulmus procera is a tree to 40 m tall, bark finely fissured into rectangles; vigorously colonial from root suckers, new twigs sometimes with corky wings. Leaves alternate, 5-8 cm long, broadly elliptic to egg-shaped, base very unequal, rough above, softly hairy below with tufts of white hairs in vein axils, margin doubly toothed. Fruit dry, flat, circular, about 1.2 cm wide, small closed notch at apex (but most are sterile). Origin: Britain, S. Europe (Rehder 1986; Dirr 1990). 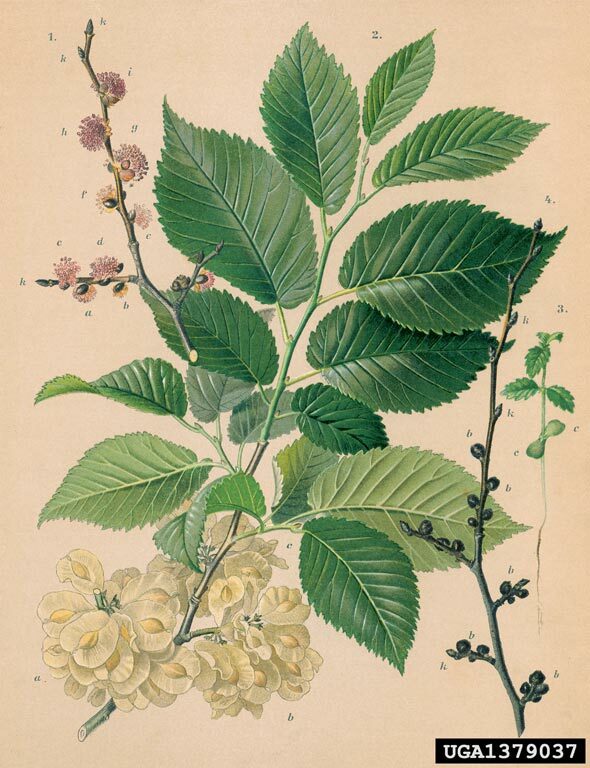 Notes: According to Dirr (1990), ours may be the hybrid Ulmus x hollandica, Dutch elm, (a hybrid of U. glabra and U. carpinifolia). Susceptible to Dutch elm disease.